The Apache Helicopter is the most advanced, versatile, deployable, and maintainable multi-role combat helicopter in the world, and now you can be the pilot. This 4 channel RC Apache Helicopter, gives you complete control of its flight. Full function remote controlled forward, backward, up, down, left and right. 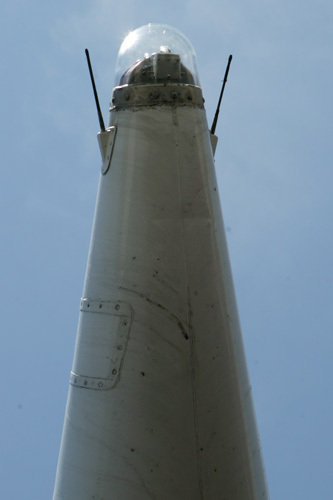 It flies over 30m high. 4 channel radio control duel propeller system and stable hover. It also features a revolutionary co-axial rotor technology and an 850mAh Li-Po rechargeable battery. It can fly up to 10 minute flight times with flight range of 120. Factory assembled ready to fly. A couple of days ago I went to Floyd Bennett Field to once again renew my fishing license. On the way in I noticed a familiar plane standing next to the new Aviator Sports Center. I went by to take some pictures, and a rather unfriendly security guard explained to me how this worked: I needed to go inside, buy some food and then I could take all the pictures I wanted and even get a tour of the inside of the plane. Don’t you hate it when security guards jump out of nowhere and will not leave you alone unless they can make you comply with their wishes? Or the way they repeatedly call you “sir”, but they pronounce “sir” as they would “jerkoff”? Anyway, despite the unpleasant tone in which this information was conveyed, it was a pretty good deal. Last time when I wanted to see the same Concord, I had to pay 15 bucks or so and stand in a long line. The inside tour was, and still is not very interesting. The chairs are not original (the real ones were auctioned off) and they don’t let you into the pilot’s cabin. Sitting down and imagining how it would have been to fly on a Concord would have been interesting. Despite that, the experience that I’ve had is even weirder. At the Floyd Bennett Field the Concorde is tied down to several concrete blocks and basically serves as a giant shade over several picnic tables. Eating cafeteria food under the mighty engines is rather unique. I ate and remembered how every fishing trip that I took out of Sheepshead Bay I waited for the loud whine that announced the streamlined needle that propelled the rich on their way to London or Paris and the sonic boom that followed a little later. Also, I remembered seeing the horrible pictures of a Concorde on fire and imagining what it must have been like for its passengers on their way to New York. 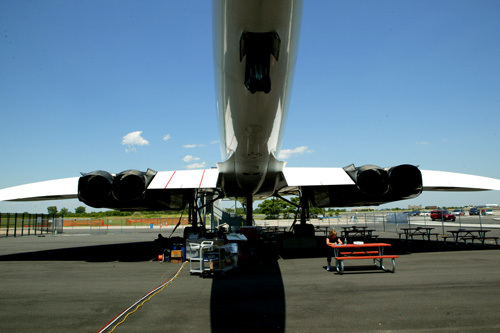 The whine of the Concorde engines over Jamaica Bay always stuck with me, and made me especially appreciate the airplane sound in Darren Aranovskiy’s “Requiem for a Dream” sequences. There’s something about that sound, the promise of a larger world, of a possible escape, of bigger, better things in life, and also of the danger of losing everything is a giant ball of fire. Is That A Rocket In Your Plaza? There is a pretty cool Centennial of Flight exposition in Rockefeller Center. It’s on until the 18th of August. Among other cool things they have full scale models of the Wright Flyer and Red Baron’s Fokker (heh, heh) , a backup Apollo bell module, a predator drone, a Harrier II, a Shuttle cockpit mockup and piece de resistance: a full scale model of a Redstone rocket!